The Epson EH-LS100 (sometimes referred to as the Epson Home Cinema LS100 in America) combines two of the biggest trends on home projection right now: it’s an Ultra Short Throw (UST) design that uses a laser light engine. Ultra Short Throw models sidestep one of the most challenging aspects of home projection – space. To that end, you don’t need a large room and unobstructed view to cast a monster image. Instead, UST models can be positioned like a TV, just inches from a wall. They’re the perfect solution when space is tight. While standard projectors have long done short throw projection, throwing a laser into the mix adds longevity and enhances colour and contrast. around 10 times the life of a standard bulb you'd find on an older projector, and six times that of the bulbs inside Epson's newer projectors. Opt for an eco-friendly lamp setting, and this can be extended to approximately 30,000 hours. Even better, Epson promises no erosion in colour intensity over a ten year period. This makes the EH-LS100 basically service free, minus some air filter changes. Another attractive benefit of a laser light source over a lamp is near instant on – there’s next to no warm-up time. Using it is like a turbo-charged telly experience. So how much is Epson's LS100 going to set you back? Around £2,600, $3000 or AU$4499, depending on where in the world you live. Weighing 11kg and measuring 494 × 172 × 437mm (W x H x D), this Epson has a serious footprint. It’s built around a 0.67-inch 3LCD device with 16:10 (WUXGA, 1920 x 1200 resolution) aspect ratio, which means you’ll see a slight grey border top and bottom. Epson has apparently taken a pro AV chassis (similarities with its EB corporate range are obvious), and re-dressed it as a consumer model. There are extraneous features on the remote control, and in the menu, which betray this Pro AV heritage. But these upscaled offerings are good news up to a point, because what you’re getting here is massively over-engineered for home use. Connections include three HDMI inputs (one with MHL), PC VGA, USB (for media file playback) and composite video. All inputs are recessed under the projector, so don’t expect to be casually plugging HDMIs in and out. 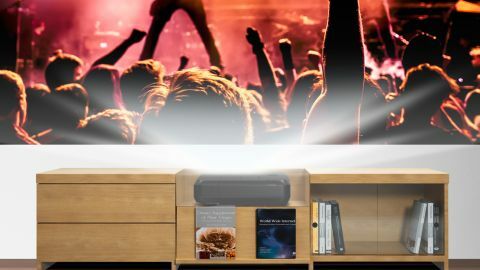 Despite its premium exterior and lavish connectivity options, however, the projector comes with a rather dumpy remote control – a disappointing addition, but far from a deal breaker here. Now obviously, the best possible results can be obtained by beaming onto a fixed, light reflecting screen, but most of us will want the screen to effectively disappear from view when not in use, so a wall will do the job. The UST form factor also lends itself to being hidden within custom cabinetry, which means there's a very good chance you keep your living room just the way it is. It couldn’t be easier to get the EH-LS100 up and running: Simply position the projector square to your wall, and use the focus lever, located under a latch by the air filter, to make everything sharp. Image size depends on its distance from the wall. While it works from just 6cm, pull back to 50 cm and you’ll get an image 130-inches across. With a little bit of shuffling, we found could practically fill an entire room wall, with no obvious visible pixel penalty. While you’re unlikely to suffer from any keystone issues, there is some geometric correction on offer to square the image up if you need it. Let's get one thing out of the way: The EH-LS100 is Full HD. Some might bemoan the fact it’s not 4K, but that would seriously ramp up the cost of a projector like this. For what it’s worth, we never felt the EH-LS100 was deficit in detail. The projector combines an unapologetically vivid 10-bit colour performance, with real dynamic bite. Black levels could be deeper, but contrast is high. The projector has a smooth, photographic quality, a long-standing characteristic of 3LCD projectors. There’s something extremely cinematic about their presentation when it comes to clarity and colour. Scenes with a high average picture brightness look fabulous, particularly animation. Moana glows with primary Polynesian hues, for example, while the medieval opening of Transformers The Last Knight looks fittingly dramatic, with vivid orange-white fireballs, dark muddied knights and spectacular landscapes. Picture adjustments include the usual brightness, contrast, saturation and sharpness tweaks, in addition to variable Dynamic Contrast (leave it on High Speed), and some deeper menu manipulation. For the most part you’ll probably be happy enough to utilise the provided image presets. The EH-LS100 is astoundingly bright. It has no problem projecting watchable pictures in a room with high levels of ambient light - sports and gaming would seem the obvious beneficiaries of this. Epson quotes a 4,000 lumens output, coupled to an impressive 2,500,000:1 contrast ratio - a consequence of its Pro AV DNA. However, to paraphrase the great Stan Lee, with high brightness comes great operating noise. The EH-LS100 hits 39 dB in its Dynamic, Bright Cinema and Game modes. This might not be an issue when you’ve got your rowdy mates round for a big match, but it’s overly intrusive if you just want to watch a movie. The good news is that it’ll drop to 30 dB in the slightly less bright Cinema mode. The EH-LS100 is a pain-free way to bring giant images into larger rooms. If you’re lucky enough to have a space that makes even 65-inch TVs look relatively small, it’s a spectacular solution. The provision of a laser light source removes the spectre of expensive lamp replacement is reassuring too. That said, it's not bulletproof: It’s a big beast, as befits its corporate ancestry, and runs with a high level of operating noise. You’ll need to invest in a capable home cinema sound system to mask it. However, if you want an ultra bright media room projector able to do justice to sports, gaming and movies, rather than a dedicated home theatre model, then the EH-LS100 positively demands an audition. You’ll need the space to accommodate it, but its 1080p images are bright, sharp and consistently entertaining.